Warm summer days ask for light and easy digestable meals. 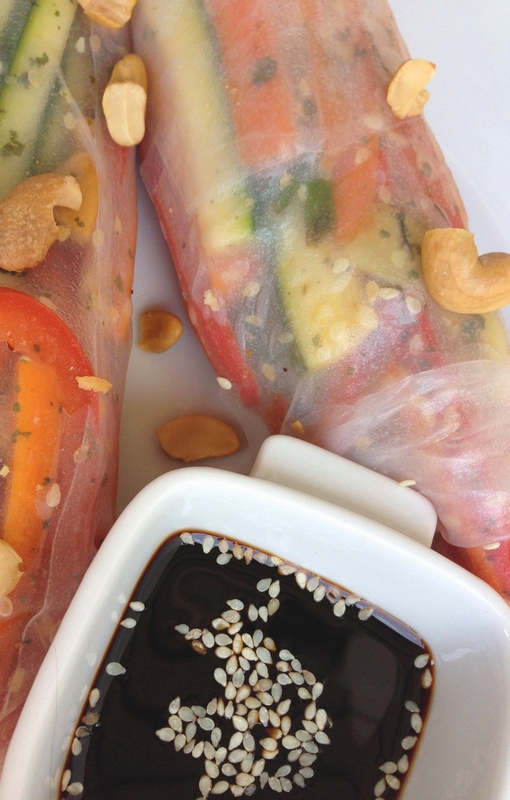 These spring rolls fit perfectly into that picture and they’re packed with yummy flavours as well! You probably know the deep fried version of the Spring Roll, known as Loempia, Lumpia or Dim Sum. But in this case the Spring Rolls aren’t fried which makes them a bit healthier. Only filled with yummy veggies, sesame seeds and cashews! They make a great dish for a lunch-to-go; take the Spring Rolls along with you in a tray and use a small jar with lid to carry the sauce! Cut all the veggies Jullienne (in small strips). Heat a little oil in a pan and stir fry the veggies for about 3 minutes. Personally I like it when the vegetables still have ‘a bite’. Turn down the heat, add the coriander and shake the pan to mix the herbs through the vegetables. Soak the rice paper following the instructions on the package and place onto the rolling mat. Divide the vegetables in two portions and place onto the rice paper. 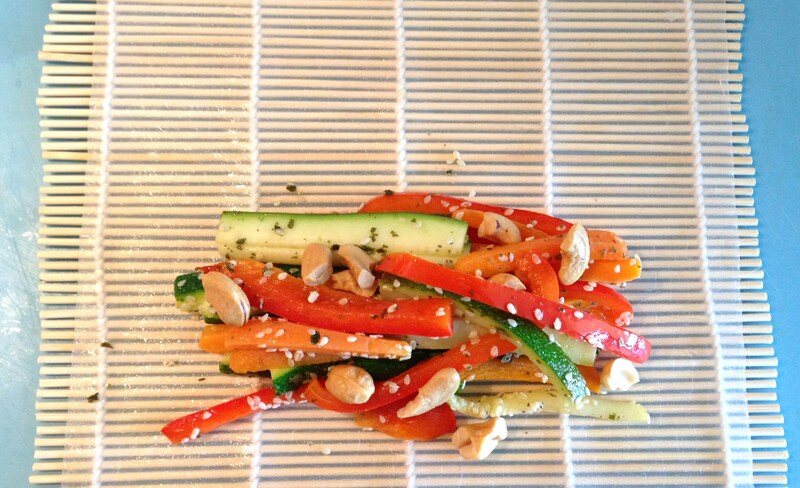 Sprinkle some sesame seeds and chopped cashews, fold the sides of the rice paper to the inside and roll up into a Spring Roll. Repeat to make the other Spring Roll. Serve with some Soy and Sesame dip: mix 2 tablespoons of soy sauce with 1 tablespoon of sesame oil and add some sesameseeds. Posted in Diner, Lunch, recipesTagged asian, comfortfood, dairyfree, diner, dinner, fit, food, healthy, healthy lifestyle, lifestyle, lunch, natural, nuts, recipe, seeds, spring roll, springroll, sugarfree, suikervrij, vegan, vegetable, vegetables, vegetarian, veggie, veggies, zuivelvrijBookmark the permalink.